That is the question that people often ask as to why the trade school teaches art. If a college student in the U.S. chooses to study art, many people often think that they won’t have much of a chance to earn a living unless they have an exceptional talent. It is quite different in Haiti. The students that graduate in art from the Beyond Relief Trade School are the graduates most likely to get regular paying jobs. Most of the jobs an artist in Haiti gets are painting signs on walls for businesses, towns and politicians. The demand for this kind of work is very high. There is also a growing need for art teachers. Haiti officials have recently decided that art classes are going to be required in all schools. The need for teachers is greater than the supply because not many secondary level schools teach art. This is an opportunity for the Beyond Relief Trade School to help even more young Haitian adults acquire the skills to become teachers. 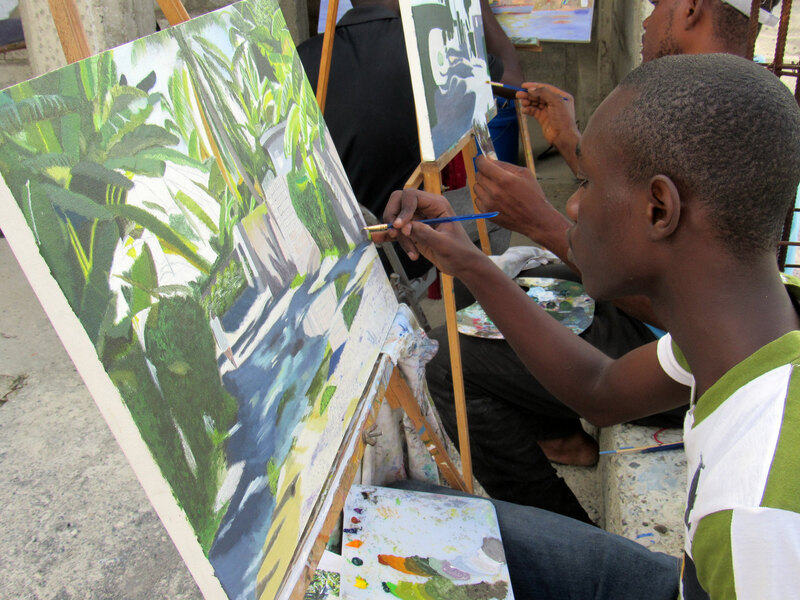 One of the greatest obstacles for Haitians is that art classes are expensive. The cost of paint and canvas is much higher in Haiti than it is in the U.S. The schools that do offer art require students to purchase their own supplies. So not only do potential students have to deal with the high cost of tuition other schools charge, they also have the high cost of supplies. This often puts art classes beyond what the majority of Haitians can afford. Beyond Relief Trade School is different because not only is the tuition for the Haitians kept very low, but our trade school just charges a small supply fee to help cover the cost of the art supplies. Beyond Relief makes this possible through donations from generous people in the U.S. that cover the majority of the cost for the class and supplies. The success of our graduates is due, in large part, to the teaching of our very talented artist, Faidrick Exavior. We are very blessed to have a teacher with such talent. He is very excited to teach the students and to pass on so much of his knowledge. Please consider making a donation to help pay for art supplies or sponsor an art student for $35/month for 2 years. You can also go to www.facebook.com/pg/BeyondRelief/shop/ to purchase a painting by one of the students or graduates of the trade school. One hundred percent of the profit goes to support the school. One of the top art graduates is John Wendy Jean-Pierre. He was one of the first art students to graduate from Beyond Relief when he graduated in 2012. He now is an art teacher in a school in Haiti and also has his paintings sold in the Bahamas. John Wendy has expressed many times how grateful he is that the Beyond Relief Trade School was started in Saint Louis du Nord so he could have the opportunity to be trained as an artist. Please help us to continue the art class so that many others can develop their talents in art that can be used in so many ways to help empower each of these students to become all that God has created them to be. You can donate online at www.GoBeyondRelief.org or mail a donation to P.O. Box 156, Rossford, OH 43460. Rita2017-05-29T16:04:02-05:00May 1st, 2017|Comments Off on How can people make a living in Haiti with art?